Although better known for its tractors and gas engines, the heart and soul of the Rock Island Plow Company and its predecessors was their implement line. In the 1800’s few company’s expanded beyond a narrow range of specialization; but Buford & Tate were prolific designers and by the reorganization of the 1880’s into RIPC, they had one of the largest and most diverse implement lines in the world. In one 1928 ad alone, over 40 categories of tractors, engines and implements were offered, and were further split with dozens of options. These compilations come from advertisements, pocket companions, long and short catalogs so do not represent the entirety of the line, instead should be considered only a large sampling. Copy write 2011, 2012, 2013 not for republication or sale without express written consent. All images are the property of their respective owners and are not to be reused without their express permission. Walking plows were a mainstay from the start of Buford & Tate all the way into the 20’s. 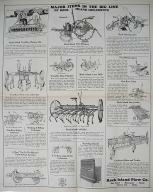 Even the 1932 catalog still had a selection of walking plows. When a walking plow wasn’t enough, RIPC had a variety of horse drawn sulky and gang plows. Rock Island would devote a lot of resources into a variety of plow designs for the tractor including the innovative CTX in sizes ranging from 2 bottoms up to 10 bottom engine gangs. With the purchase of the Smith Mfg Co, the Great Western line become integral to the RIPC until its closure. A variety of manure spreaders were available for all size farms. RIPC was world famous for being one of the few companies to offer a full line of implements, not just a specialization. However, the shear volume of cultivators RIPC produced was second only to their combined plow lines. RIPC laid claim to innovating the hay loader, and the purchase of the Chambers, Baring & Quinlan Company brought a variety of rakes and tedders into RIPC’s catalog. RIPC also offered a variety of planters and listers as well as drills. Although not well known for wagons and buggy’s, RIPC did for a time offer them. Another Great Western product acquired by RIPC with the purchase of Smith MFG. Besides their own lines, RIP also acted as jobbers for other companies products through their branch offices. Eureka, Babcock, Joliet and Frost & Wood were prominent companies.